The Red Rockettes are Utah’s only strictly recreational roller derby league. Being around roller derby in Salt Lake City, I have heard different questions and statements about this group of skaters. Some spectators think they’re just your average recreational team. When I asked a skater from another league what she thought of them, she said, “Oh, The Rockettes? Well, they dress cute.” One time, I even heard one of the officials say, “Well, if you’re not serious about roller derby, they are the team to skate with.” Sure, they might dress cute, but to say they are just a recreational league doesn’t give the Red Rockettes the respect that they deserve. If you’re interested in roller derby, it is a great place to start, and everyone needs to start somewhere. From eager student to successful surgeon, from seasoned veteran skater to brand-new baby deer–leg skater, the women who skate with the Rockettes come from all walks of life and all levels of skating skills. The league welcomes all levels of skaters, spectators and officials. Quite a few people began their love for roller derby here with the Red Rockettes. 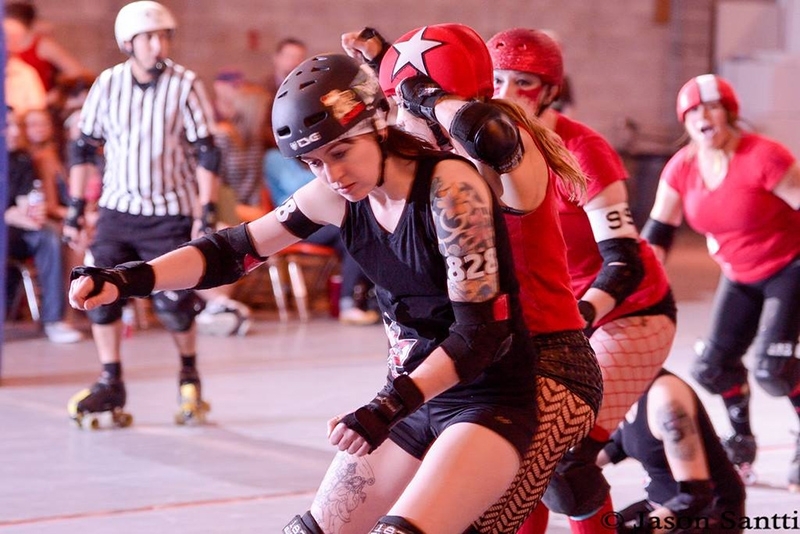 The Rockettes split into two teams for their bouts—the Cherry Bombs and the Black Hearts. As the teams took the track for warmups, you could feel the excitement building in the warehouse, the crowd eager to see their friend/daughter/mother/coworker play roller derby for the first time. With lots of practice, patience and determination to pass their minimum skills, these girls were noticeably excited and nervous. With the sound of the whistle, the first jam began and the swelling excitement in the warehouse burst into cheering and shouting. The Cherry Bombs jammer, Chasey Jones, wasted no time jumping off the jammer line, pushing through the pack and picking up lead jammer status. Over the next few jams, it was easy to see that these two teams were pretty evenly matched and the strategy, skills and endurance the skaters had been working on were paying off. The Cherry Bombs quickly took and held on to the lead for the first half of the game. However, not to be underestimated, the Black Hearts quickly rallied and began to push their offense and defense, giving the Cherry Bombs a fight for the lead. With big points from their jammers—Lucky Vixen and Darth Jader—the Black Hearts narrowed the score. The Cherry Bombs—determined to keep the lead—pushed back, tightening their defense led by their blocker Jammy Dodger. They laid down some impressive hits and strategic blocking, holding the Black Hearts from scoring. The Cherry Bombs expanded their lead when their jammer, Punchface Momma, picked up 31 points with a power jam. The halftime score reflected the power and determination of the Cherry Bombs with 150 points to the Black Hearts’ 77. The Cherry Bombs’ lead did not dampen the Black Hearts’ perseverance to come away with the win. 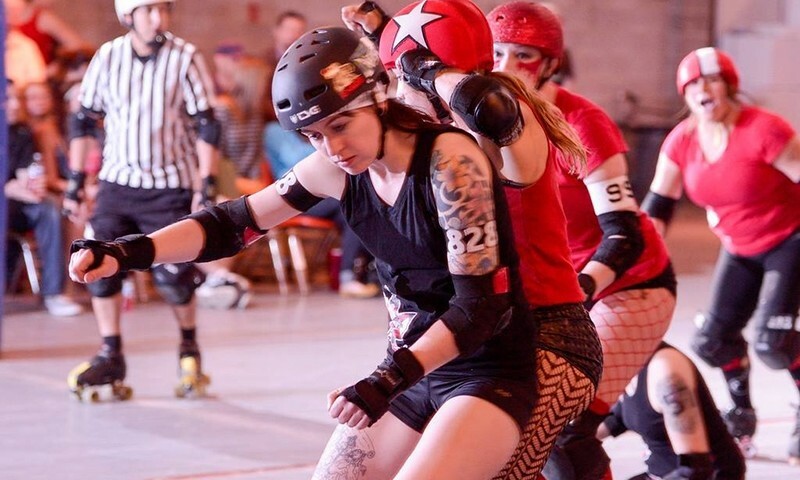 Bringing her team’s forces together and pushing for the fight, the Black Hearts’ jammer, Scissorella, successfully held the Cherry Bombs’ jammer, forcing a penalty and allowing a power jam to happen for Lucky Vixen, who was able to pick up 19 points for their team. During the second half of the game, we saw the Black Hearts push hard, and then the Cherry Bombs push back a little bit harder. The Cherry Bombs jammer, Taboo, seemed unstoppable in the second half. Jumping, pushing and juking through the Black Hearts’ defense, she seemed to not be physically fazed from the battle on the track. She picked up big points for her team with several power jams and quick skating. The Black Hearts fought hard, but it was not enough to take down the Cherry Bombs. Final Score: Cherry Bombs 242, Black Hearts 174. The Red Rockettes invite anyone and everyone to come and learn the sport of roller derby. Whether you want to become a skater, spectator or NSO (non-skating official), they are always looking and excited for new people interested in the sport. The Rockettes practice every Thursday from 7pm-10pm and their sessions run 12 weeks, ending with a bout on the 12th week. Roller derby has always been a DIY sport and could use all the support and volunteers possible, and joining the Red Rockettes is a fantastic place to start. The new session for the Rockettes begins April 2nd and will end in June with a bout. Be sure to come check them out—they scrimmage every third Thursday of the month and it is a great place to start learning the sport of roller derby. To get in contact with the Red Rockettes, check out their Facebook page.